You have just found the simple KISS Capital System that can give you all three. Fill out the "Apply Now" form in the right column of this site and get pre-approved so we can act quickly on your next deal. What I am hearing most from Real Estate Investors is they can't find the deals! You have just found your Real Estate Marketing Specialists who can get you the Leads you need to create Sales - for both buying and selling houses. There simply is not another complete Marketing System for Real Estate Investors out there. I looked. I know you are struggling with the overwhelming, sometimes conflicting list of what you need to do for marketing. And you simply do not have the time, money, or resources to get it all done. Now you have the answer to generate you leads without marketing taking over your life. STEP 3: Mentoring/Çoaching - Every successful entrepreneur had Mentor or Coach. For those of you who are serious about Real Estate, I will personally coach you to win the game first, win your division second, and ultimately take the National Title with the #1 Ranking!!! "Every successful real estate investor I spoke with or heard speak talked about their Mentor." I came to the conclusion that a Mentor was what I was missing, what was keeping me from the success I wanted. I still have my Mentor today and will never be without one. 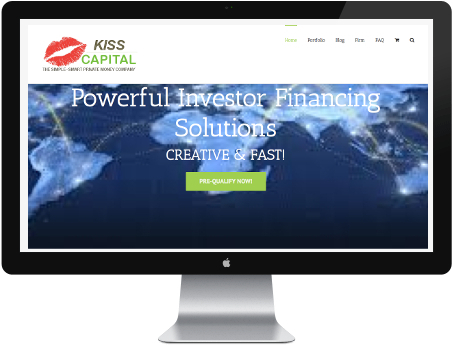 KISS Capital is the Key to Your Success The Easy Way. Pre-Qualify for Your Loan Now. Help You Make More Money Faster. Sign up below for FREE and I will keep you updated on the latest news so you can Make More Money in real estate! I will bring you the cutting edge techniques that are WORKING TODAY. Real estate has trends within itself. The requirements change. The criteria change. The market changes. We I can do for you is provide you with the latest research showing what you should be doing NOW. Sometimes it is what you did last quarter. But more often, I bring to you the changes of the future that you need to begin to use NOW. A prime example is Artificial Intelligence. If you aren't using this, you are behind the curve. Contact me today for details!